In 1937, the Lytham St Annes town council met and decided to close their popular and busy tramway and replace their trams with buses. This would have an impact on the Blackpool Tramway as they often would hire a large number of their trams during the Illuminations period when as many as 200 trams would often be in service to move the crowds wanting to see the lights. The closure of their tramway and the loss of the additional trams would leave Blackpool Corporation with a shortfall of trams to operate during this busy period. To counteract this, Walter Luff, head of Blackpool Corporation Transport, ordered 20 railcoaches from Brush of Loughborough. The reason that Brush were chosen to build this batch of trams was that the person who had originally designed the original railcoaches at English Electric in Preston, had transferred to Brush. The Brush Railcoaches were similar in almost every respect to 45 English Electric railcoaches that entered service in Blackpool 3 years earlier, except that there were slight differences to all elements of the design due to copyright of the original design being held by English Electric. Each tram was fitted with sunshine roofs ( a canvas centre section that could be folded back in the good weather), curved roof windows in each saloon, a clock above the entrance to the driver’s cab in each saloon, wind down windows in each saloon, power operated doors and Crompton and Parkinson Controllers. The Brush Cars entered service in 1937 and were well received by the public. Initially they were allocated to Rigby Road Depot and operated on the Lytham Road route from Squires Gate - Bispham alongside the Balloon Cars that did the Squires Gate – Cabin service. Originally, the driver opened the doors at each stop from their cab. This was soon changed to the doors being opened by the conductor, when during a particularly busy run down Lytham Road, the platform was loaded with passenger’s luggage and the driver opened the wrong set of doors and some of the luggage fell out of the tram and onto the road, where it was crushed by a passing bus! In 1939, World War Two began and in common with the other members of the fleet, the Brush Cars were repainted into a mainly green wartime livery, with roof windows painted out, bulbs downgraded and mostly painted over and hoods fitted over the top of the headlights. Bispham Depot, which had been used as a store, was reopened as a running shed in 1940, to allow the dispersal of the fleet in case a bomb hit Rigby Road Depot. The Brush Cars were transferred here and began operating the North Station – Fleetwood service alongside the Pantograph Cars. They also continued on some duties on the Squires Gate – Bispham service. After the war ended in 1945, the Brush Cars were soon repainted back into a brighter livery featuring more cream paint. In 1948, Blackpool Corporation began trials using the revolutionary VAMBAC equipment which allowed smooth and quick acceleration and braking. Brush Car 303 was chosen to receive the new equipment. Although it had the most up to date equipment, it was not popular with crews as it was different from the other cars. It had been planned to operate the tram on the Marton Route alongside the other VAMBAC fitted cars, however it was not suitable as its air operated doors were deemed to slow down the loading of the tram. 303 was returned to Bispham Depot and saw little use on service and was mainly used on specials but only as a last resort. During the late 1950’s, the Brush cars began to be overhauled. Some of them received new single destination screens at each end, requiring a new dome at either end to be fabricated as the double screens were built into the domes. This modification was done on an ad hoc basis with 621 not being completed until 1980! They began to be repainted into a new half green / half cream livery with orange trolley towers around this time. In October 1962, the unique VAMBAC fitted Brush Car 303 was withdrawn and transferred to Marton Depot, where along with a number of cars deemed surplus after the closure of the Lytham Road and Marton Routes, 303 was scrapped in March 1963. On 27th October 1963 the North Station route closed and with it, their home of 23 years, Bispham Depot. 290 was the last Brush Car from North Station to Fleetwood. The 19 remaining Brush Cars were transferred to Rigby Road and spent most of the winter in the works. Work done included the replacement of the Crompton and Parkinson controllers with Z4 Controllers and the saloon heaters from scrapped English Electric railcoaches. The original wind down windows were also replaced by ex railcoach windows and the sunshine roofs were panelled over. They re-emerged from their hibernation at Easter 1964 and began operation of the Starr Gate to Fleetwood service all year round along with the remaining EE railcoaches. Brush Car 301 was withdrawn following a collision in 1966 and was stored in the bus yard, before being scrapped in early 1968. With the introduction of a computer system at Rigby Road and the resulting need for the renumbering of the fleet, the remaining 18 Brush Cars were renumbered from 621 - 638. In 1969, Brush Car 628 was in a collision with Balloon 726 and was withdrawn. The body was scrapped and the underframe was converted to a rail carrying trailer complete with rail crane. 628 was renumbered to 748, then later 260. 748 was originally towed by Works Car 5, however it was withdrawn for conversion to an OMO and 260ended up with a new partner - Brush Car 624. The costs of running the tramway was quite high at this time and Blackpool Corporation were looking at ways to reduce those costs. As an experiment, they experimentally converted Brush Car 638 to work as a one person operated tram. In converting the tram, the cab partitions were removed, doorways were fitted at the first window behind the driver with the seats being removed. The driver had a swivel chair to allow them to turn round to collect the money. The experiment was a failure because the tram's capacity was reduced ( it was only 48 prior to the experiment taking place). It was soon converted back to a two person car. Brush Car 624 was still in almost original condition and was in need of an overhaul, instead of receiving the overhaul needed to remain in service, she was painted dark green all over and used as the permanent way car from 1971. During the early part of the 1970's the conversion of the E.E. Railcoaches to OMO cars was in full swing, Blackpool Corporation were also considering converting the Brush Cars to OMO cars, however they discovered that their underframes and body frames would need substantial work to make them suitable for conversion. However, the OMO program would have different consequences for two Brush Cars. Brush Car 629 was withdrawn in 1972 in need of an overhaul and with its withdrawal falling in the middle of the OMO rebuilding, it was stored until 1980 when the decision was taken to scrap the tram instead. 635 was withdrawn in 1974, however it was lucky and was donated to the Tramway Museum at Crich for preservation and moved there in 1977. 635 is still awaiting completion of its overhaul and is currently in storage at Clay Cross. In 1975, Brush Car 622, received the first all over advert for the class with it receiving an advert for Blackpool Zoo, called Tigeriffic, that it would retain for 5 years. Meanwhile 634 was painted in a special livery to celebrate Blackpool's Centenary in 1976, this advert would be altered during the winter and in 1977, the advert was for the Silver Jubilee of Queen Elizabeth II's ascension to the throne. With the introduction of OMO 13 in 1976, the Brush Cars were relegated to summertime use only, however they were also to receive an overhaul, with all bar Brush Car 636 losing their curved roof windows. The interiors of each Brush Cars was to be repanelled, receive new flooring and new ceilings, they were also fitted with bare bulb lighting. Many of them retain these interiors today. 638, which following the failed experiment with one person operation, was converted back to a conventional Brush Car, albeit with a slightly different interior to the others, was withdrawn in 1980 in need of a major overhaul. The overhaul was not forthcoming for the tram and it was stored outside in the bus yard and it was deemed surplus to requirements and scrapped in March 1984. Brush Car 637 was withdrawn from the passenger fleet in 1984 for use as a dedicated driver training tram, however by 1986, she was once more carrying passengers. During the 1985 Tramway Centenary celebrations, no Brush Cars were included in the line up for the tram cavalcade, however Brush 621 did manage to find its way into it as it was caught up near the end of the line up as it was working a journey to Starr Gate at the time! In the latter half of the 1980's, major overhauls were carried out to 5 of the fleet of Brush cars. Brush 621 received a pantograph instead of a trolley pole, had its interior tidied up, remedial work to its underframe carried out and new made to measure hopper windows to replace the half drop windows carried since the 1960's. Unfortunately, the new windows were deemed to be too expensive to replace the whole class and the 3 ex towing railcoaches so they all received hopper windows from withdrawn and scrapped OMO cars. 623 received a pantograph instead of a trolley pole, had it's interior repainted, half drop windows replaced with ex OMO hopper windows, ex bus seating fitted to replace it's swingover seating. As 623's overhaul was almost complete, disaster almost befell the tram as a fire broke out on the tram. Luckily the fire was spotted in time and put out. 623 had it's damage repaired and was soon back out on the prom again. Both 632 and 634 received a pantograph instead of a trolley pole, had extensive repairs done to their underframes and were given a general tidy up. Both trams retained their swing over seating though they did receive ex OMO hopper windows. The most extensive of the 5 overhauls done at this time, however was that done to Brush Car 637. In 1990, 637 was to receive a major overhaul that would be the basis for work done other members it's class in the future and was a step above that which had been done to other trams in the class already. 637 was to receive underframe repairs, new tactile dot flooring, new interior wall panelling, new ceiling panelling, with enclosed bulb lighting, a pantograph replacing the trolley pole, ex omo windows and bus seating. The tram was outshopped in 1990's livery and returned to service. However it was soon back in the works as conductors complained that the ex bus seats were too wide and that they were making the aisle's too narrow to get through when collecting fares. They were soon replaced with narrower ex routemaster seats. Another repaint was on the cards for 637 as well as it was to receive an all over advert for Coco's adventure play centre. The tram was repainted, fitted with backlit roof advertising boxes and returned to service only for Coco's to go out of business a week later! The tram ran in service with the advert still in place with the phone numbers blanked out for almost a year before another repaint and another all over advert would replace it. In March 1993, the final three OMO Cars remaining in service (numbers 5, 10 and 11) were withdrawn from service. As there were lo longer enough single deck one person operated trams available to cover for any failures or scheduled maintenance with the Centenary or Jubilee Cars during the winter months, it was down to the Brush Cars and Ex Towing Railcoaches to fill the gap. Mostly, this would be covered by the heater fitted examples such as 625, 626, 627, 630 and 631, however occasionally non heat examples found their way into service as well. control box was located in one of the passenger saloons requiring the removal of a double seat and the resulting reduction of the seating capacity from 48 to 46. 626 was returned to service in 1994 in 1990's fleet livery. 631 was next to be done, followed by 630, which re-emerged in 1995 and 1996 respectively. The only difference from 626's overhaul was that the control box was located underneath the pantograph tower, meaning that the capacity for both trams could be maintained at 48 seats. By 1999, Brush Car 633 was in a poor condition and was withdrawn from service in need of an overhaul. The tram was stripped down to a shell to assess what work would be needed to get the tram back into service. However rather than being returned to service as a regular Brush Car, 633 was chosen to be the basis of a new illuminated tram, the Trawler. The reason for this was down to the withdrawal of both the Rocket and the Western Train, which left a shortfall of illuminated trams. More information on 633's time as an illuminated tram can be found on the illuminated trams page. During the early season and the last week of the illuminations, from 2000 -2004, the operation of the timetabled services was left in the hands of the Brush Cars and ex towing Railcoaches in a bit to boost reliability (which they did and quite drastically at that) following a number of Centenary Car breakdowns. 2003 proved to be a real Indian Summer for the Brush Cars, with the double decker ban to Fleetwood being in force, a number of them saw daily use both on specials and service during the summer. In November 2003, 636, the final Brush Car to retain roof windows, had them panelled over. 636 became the first and only Brush Car to receive Metro Branding during 2003. It received line 14 green and yellow livery and looked very smart. 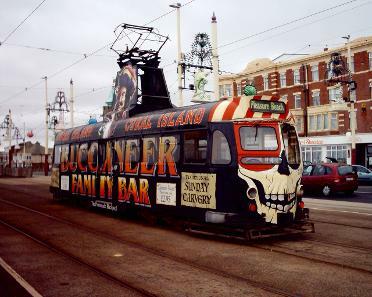 Following a reduction in the number of passengers using the tramway and the number of holidaymakers visiting Blackpool in general over the first few years of the new millennium, 25 trams were mothballed at the end of the 2004 season, amongst those withdrawn were all of the Brush Cars except for 626, 630 and 631. Of those withdrawn 5 of them never operated in Blackpool again. Fortunately in 2005, two Brush Cars, 622 and 623 were reinstated to service although 623 only ran in service once and spent the rest of the season as a driver training car. The return of 622 occurred as Glyngarry Windows who had been advertising on this particular tram decided to renew their contract for another season. Due to a shortage of available suitable trams to carry adverts, the decision was taken to re-activate 622. 622 wouldn’t have been returned to service otherwise as it was in poor condition compared to some of the other Brush cars which were withdrawn. 625 was rumoured to have also been lined up for a return to service as a reserve car but this never materialised, it was also surprising that this particular car was even being considered for a return to service as it was also in poor condition and had rarely ran in service in 2003 or 2004. Brush Car 622 remained in service into 2006, initially in all over white base coat, before receiving an all over advert for Pontins, whilst 626, 630 and 631 also remained in service. Works Car 259 (ex 624) was donated to the LTT for restoration to it’s original condition. During 2006, Brush Car 636 was loaned to Stored Energy Technology in Derby to allow the tram to be used for testing a new set of motors and trucks that they were developing at the time. 636 returned to Blackpool to allow for further tests on the new equipment to take place on the section of track between Starr Gate and Pleasure Beach during early 2009. Brush Car 623 was re-instated to service in 2007 having been repainted into Wartime livery in celebration of 70 years in service for the Brush car. preservation, however not before being repainted, receiving overhauled new trucks and returning to service during 2010 and 2011. Brush Car 627 made a one off return to service on 8th November 2009 after 5 years in store to operate the final journey on the section of track between Ash Street and Fleetwood Ferry before its closure for rebuilding prior to the upgrade of the line. The reason that 627 was chosen was because as 290, the tram worked the final service from North Station - Fleetwood before the North Station section closed in 1963. With the impending upgrade to the tramway, all remaining Brush Cars except for 631 were put up for sale in January 2010 and were all sold quickly. 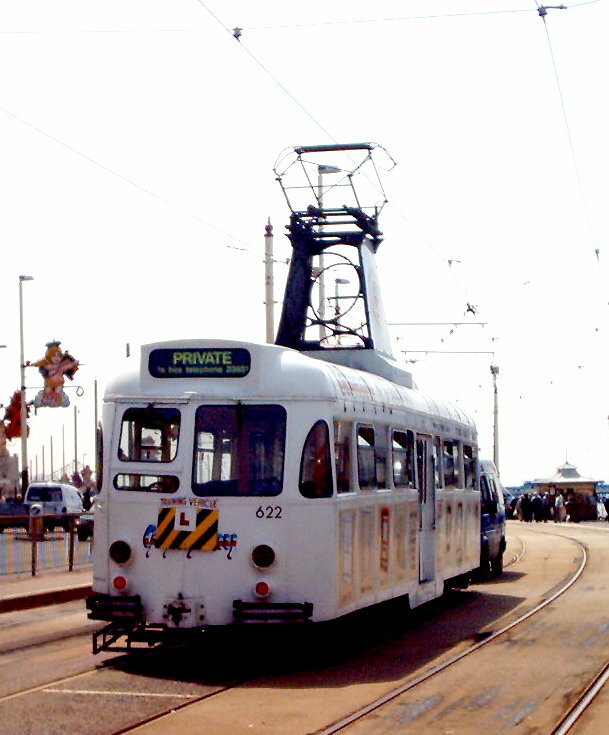 623 was bought by the MTMS for use at the Heaton Park tramway and left Blackpool in 2010. 622 was withdrawn at the end of 2009 and was bought by the LTT as a source of spare parts for its heritage trams and transferred to the LTT depot on the outskirts of Blackpool. However, before it went, it surrendered its recently refurbished trucks for use under 632. 626 was repainted into 70's green and cream during 2010 and was expected to see use as a dedicated driver training tram, however the tram was used a number of times on the timetabled service before being sold and moving to the Birkenhead tramway in August 2010. 632 returned to service during June 2010 as part of the 125th Anniversary celebrations to compensate for the loss of so many other members of the 1930's fleet, 632 was painted in half green, half cream livery with roof advert boxes for the Videoscene tram shop at the North Pier. 630, 631 and 632 continued in service during 2011 with 631 and 632 operating on the final day for the traditional fleet on 6th November 2011. 630 was withdrawn the previous week to receive a repaint back into 90's green and cream prior to its move to Crich early in 2012. 621 and 627 moved to Kirkham Prison to be restored for the Friends of Fleetwood Museum, 625 and 637 moved to open storage for the Birkenhead Tramway in a yard in Knowlsey in Merseyside before moving to outside storage at Fleetwood Docks in 2015. 630 entered service at Crich in Summer 2012, running in it's 90's green and cream livery and has seen regular use. 622 was repainted into a version of the Tigeriffic advert that it carried during the 1970's moved to Anchorsholme Primary school for use as a static classroom. 632 was in open storage in a yard at Burton Road Blackpool however it returned to Rigby Road in Summer 2014 and will hopefully join the heritage fleet soon. Former Engineering Car 259 (ex 624) was also in open storage at Burton Road but returned at the same time as 632. 259 it will need a major overhaul before it can operate. 631 entered service with the heritage fleet in Blackpool in 2012, initially in the condition that it finished service in: retaining its all over adverts for Walls Ice Cream, however after regaining some of its original features including swing over seats, original style lifeguards and the modern headlights and indicators being removed and replaced with traditional headlights and a repaint into a 50's style version of Green and Cream, it looks more the part. Brush 627 was repainted into a commemorative livery for the Queen's Diamond Jubilee and displayed on a temporary siding at the Pleasure Beach, It received a grafitti art paintjob in 2013 and half green / cream in 2014, before being moved to Rigby Road depot for under cover storage in 2015. 621 was transferred from Kirkham Prison north to Beamish, who had plans to restore the tram as 284. 625 and 637 now also have new owners and work is beginning on their restorations. Brush Car 634 returned to Blackpool after 6 years away in early 2016. It's previous owner, Andy Ashton has done a fantastic job of the restoration of the interior of the tram, whilst the outside has been repainted, losing the Marton Mere Holiday Park advert it carried when sold and it is now painted in 90's green and cream livery. It is hoped that 634 (and hopefully 632) will return to service in the future. Brush Car 621 was bought from Friends of Fleetwood and went to Beamish, where it was expected to be restored as 284 in original form. However due to a change in direction for the transport at Beamish and a lack of depot space, the tram was offered back to Blackpool Heritage trams and it returned to Blackpool in December 2016, and was restored and returned to service in time for the September Gold weekend, when it re-emerged in 1950's Green and Cream livery but retaining its 1970's style interior. 623 returned to Blackpool in June 2017 on loan until the end of the illumination period to allow it to feature in the 80th Anniversary celebrations and made its debut run on 14th July, the tram will make it's final run in Blackpool on 14th July 2018 prior to returning to Heaton Park. Following a 5 year period of outdoor storage, 625 returned to Rigby Road for further storage in June 2017. 630 also returned to Blackpool during September 2017 on loan until 2018, returning to Crich in late May 2018.